Juan Ovzem is a character in the Grand Theft Auto series who appears as a minor and multiplayer character in Grand Theft Auto: Vice City Stories. 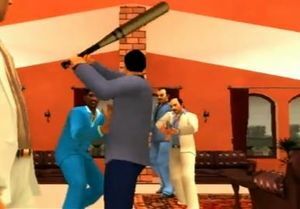 Juan is a member of the Mendez Cartel and hits Lance Vance with a baseball bat during the mission Burning Bridges. His name is a take on the phrase one of them. One of the first two goons that Victor Vance (when the player is in control) kills in the mission Burning Bridges is the same model as Juan Ovzem. Juan about to knock Lance Vance out. This page was last modified on 10 August 2012, at 10:37.